All letters sent home regarding school trips can be found at the bottom of this page. We are proud to offer an amazing range of fantastic learning experiences for our children with the trips, residential visits and workshops our children take part in. We have found that going on a trip or residential visit or having special visitors to school can bring learning to life for the children and improve their vocabulary, writing, social skills or leadership skills. Unfortunately there is often a large cost to school of running a trip or a workshop, which is why we have to ask parents for contributions when these happen. Recently we have found that some of our school trips and visits have cost the school hundreds of pounds as some parents have not paid any contributions. The school cannot keep funding trips without it affecting other areas of learning. If you are having difficulty with paying for a trip, then please contact the school office confidentially. We can set up small payments on Parent Pay – sometimes even £2 per week can make a huge difference to spreading out the cost. We can continue to take payments even after a trip has finished so the weekly cost can come down. We will not be able to provide trips for free to anyone – but if you are having genuine hardship then we can work with you to help with the cost of trips and visits. If this is the case then please contact the Headteacher or the Family Support team in school. We appreciate that it is difficult when schools ask for money, but hope that we can work together on a solution to make sure that the children get the best experiences possible. Please speak to your child’s class teacher if you have any worries or concerns. 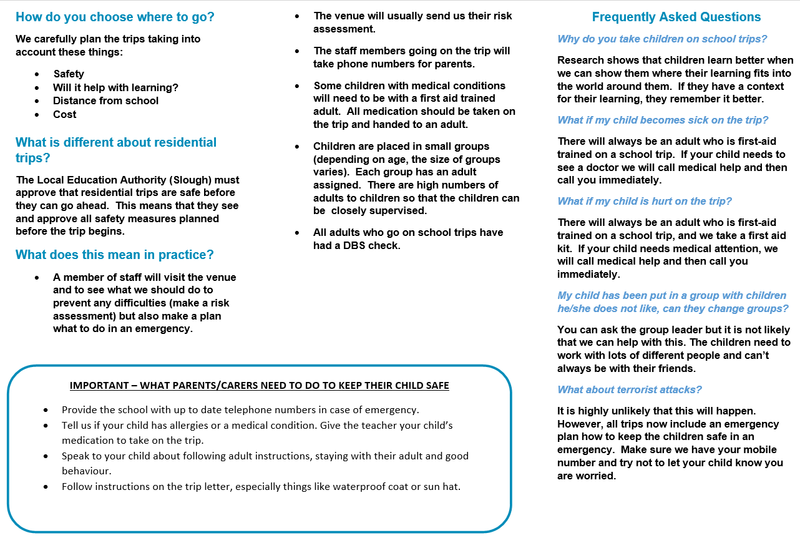 If you have any worries about a school trip please contact the organiser of the trip (their name will be on the letter). If you are concerned about a child, please contact any member of the Senior Leadership Team. Their photos are on posters in school. Click here to view to view Education Visit's summer newsletter.